Race details at www.NoExcusesRunning.com as we get closer to the date. 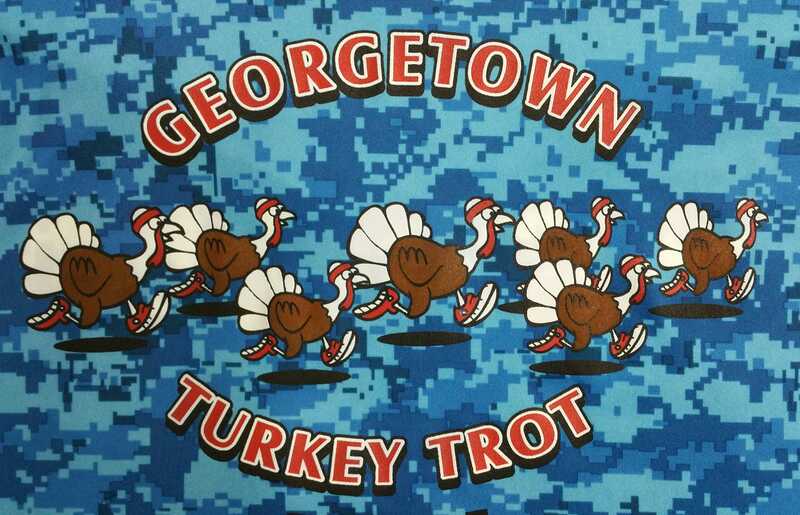 The Georgetown Running Club and Sertoma are hosting the Georgetown Turkey Trot again. Challenge your family, friends, and co-workers to come out and run on the roads and trails in Georgetown that starts and finishes in beautiful downtown Georgetown on the square. The race will feature an untimed 5 mile run/walk and 1 mile walk (both starting at 8am), sponsor booths, and tons of fun! Fun course that is ideal for the walker to the competitive runner and everything in between. Great for strollers too!! Dogs are welcome but they must be on a leash and you need to pick up after them. Please no children on bikes on the course. There will be The Caring Place Kids' Fun Run too! 5 mile run & 1 mile walk is $30 online ($25 for Georgetown Running Club members), includes a shirt (guaranteed long sleeve tech shirt for entries received by 11/5, after that while supplies last). Entry fee increases to $35 on Nov 6 ($30 for Georgetown Running Club members). Online registration ends Wednesday, 23rd, but entries accepted at packet pick-up and race day. Entry increases to $40 on race day, Nov 23rd. All Georgetown Running Club members receive a $5 discount. Guaranteed long sleeve TECH shirt for entries received by 11/5, after that while supplies last, so register before 11/5! You must also pick up your shirt at packet pick-up. No shirts will be held after the event. Presented to the overall male and female, overall masters male and female, top 3 male and female finishers in the 14, 15-18, 19-39, 40-59, and 60 and over. All awards to be given out as you finish!